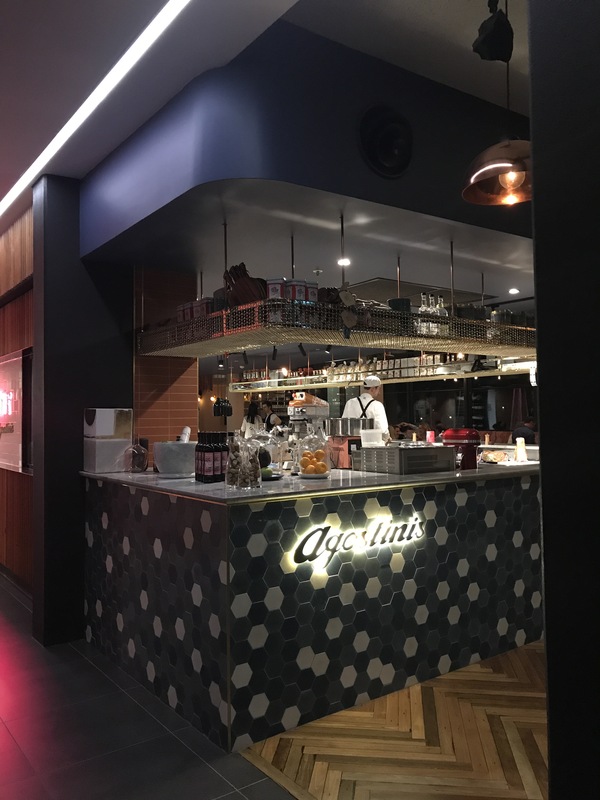 I had such high hopes for Agostini’s, the latest Italian restaurant to open in the Canberra dining scene. 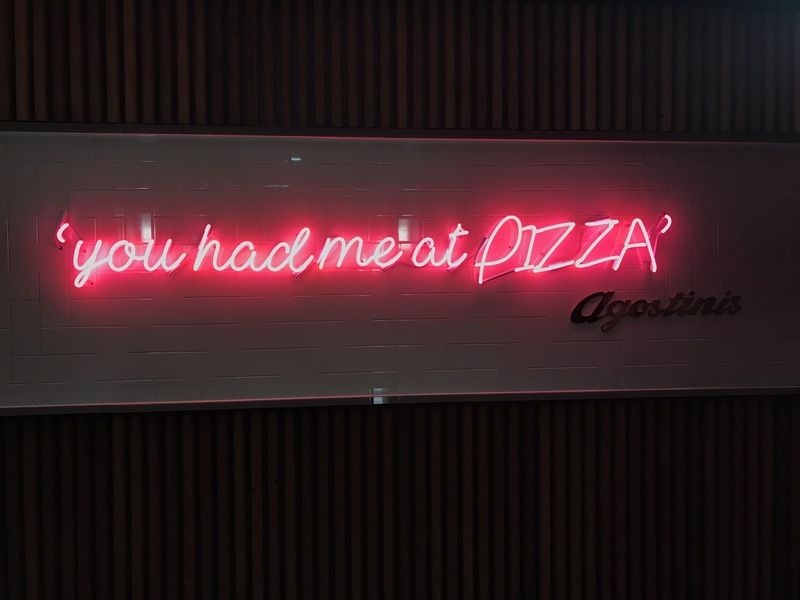 The lure of their pink sign and the promise of handmade pasta and authentic pizza easily convinced me to have one of my birthday celebrations there with some close friends. When I had booked two weeks ahead for a Monday night, I thought I was being super organised. It caught me by surprise when I saw that we were expected to leave after two hours for the next booking. I assumed they were super busy and I would endeavour to eat as fast as I could. It turns out that we weren’t rushed at all, there must be a two hour allocated seating time for bookings through Dimmi. Affogato House-made vanilla gelato served with an espresso & your choice of digestivo: Cafe Patron XO Tequila, Frangelico or Grappa ($15.00). My friend requested to omit the digestive and we were still charged the full amount. That is one expensive coffee shot! Gelati choice of 3 flavours – vanilla, coffee liquor, chocolate peanut butter ($10.00). They had some strange choices (cherry salted caramel?) but we opted for these flavours, which were very nice. It is probably best to clarify the flavour choices as we thought there was a cherry flavour and a salted caramel flavour, not one flavour with cherry and salted caramel combined. Agostinis’ tiramisu made to order… savoiardi biscuits, freshly brewed coffee, mascarpone & chocolate mousse ($12.00). This definitely made your eyes widen as your hit that base that started to pool with coffee. Being made to order meant that there were some crunchy parts of the tiramisu which I thought was a bit odd. My friend and I ordered one each and if you add the part that I had eaten with the part that she had eaten, we wouldn’t have even finished one portion. It was too strong, too much mascarpone and too OTT. I found the service really terrible. No one was rude or unpleasant but they needed constantly prompting. Can we have more water? Can we get cheese for the pasta? Can we get more wine? On top of that, we found ourselves needing to ask more than once because no one came back for almost 20 minutes. For a restaurant that wasn’t terribly busy, I felt that we were forgotten about A LOT. I won’t be rushing back here in a hurry, but I would come back for their pizza and hope that their pasta and service improves. I saw on Canberra food geek’s instagram that On Flinders does a mighty fine pizza, so when I found myself looking for dinner before an early movie, I knew where I wanted to go. I don’t go to Manuka very often but On Flinders’ name is pretty indicative of its location and it is right next to Public. Flinders mozzarella, bocconcini, prosciutto and basil ($20.00). Finally, someone that understands that every slice should have all the ingredients and you don’t need to fight to the death for a slice that has a tiny bit of meat on it. This was a really good pizza, not the absolute best that I’ve had but man, double points for the generous toppings. It makes me smile that almost every bite I took had delicious prosciutto. Basil and prosciutto on every slice and all topped off with lots of cheese. YUM! The service was polite and efficient; just be mindful that they only make pizzas during certain times. I’m definitely going to be back to try more of their vast menu. As you can tell from the half eaten slices of pizza, I wasn’t planning on blogging about my casual family lunch at The Sawmill but the pizzas were so good, I had to write about it. Wild rice salad wild rice, kale, cranberries, fetta ($20.00) with added grilled chicken ($4.00). I have only had kale chips, so I wasn’t used to the texture of uncrunchy kale but the flavours with wild rice, cranberries and fetta are a great idea. Margherita buffalo mozzarella, basil, tomato base ($20.00). It is a simple pizza topping but our favourite pizza choice and Sawmill definitely delivered; it was the favourite pizza of the table! I would definitely order this again. Peccati di gola salami, ham, pancetta, Italian sausage, mozzarella, tomato base ($24.00). It would seem very meat heavy for some, but I really enjoyed this. Sfiziosa smoked ham, onion, mushroom, artichokes, Italian sausage, bianco base ($24.00). This wouldn’t have been my first choice but it was nice to have a mix of vegetables and meat on at least one of the pizzas. I found the staff really friendly and accommodating when we rocked up without a booking. The pizzas are so good because the ingredients are fresh, the bases are fantastic and you can’t beat a wood fired oven. I’m getting a craving as I write this post. The smell was so intoxicating from Da Bronx as we left Frankies at Forde, that all company involved didn’t mind skipping out on a fancy restaurant to stay in for a delicious pizza gorge session at home. Finding the menu took a bit of googling and Facebook stalking but we were surprised to see that there was no garlic bread/pizza option. When I rang on a Saturday night, I was asked if I wanted fish and chips or pizza and after confirming I was ordering pizza, I was warned that ordering more than one pizza was going to take 1 hour. We were willing to wait. Taken from their Facebook Page. All 18 inch jumbo pizza ($19.90)~ I didn’t know how big 18 inches really was (#gometric) but when TimmyC brought the pizzas into the house, the pizza boxes barely cleared the doorways. A hand posing as a size reference. Roast vegetable supreme roasted peppers, zucchini, chargrilled eggplant, fresh tomatoes, mozzarella. 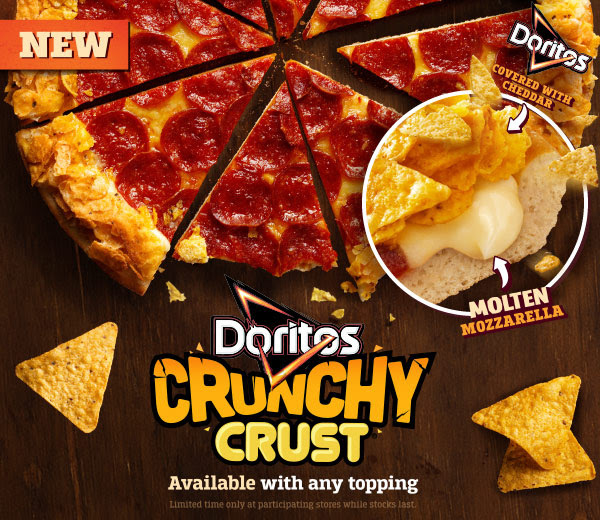 I didn’t think I would enjoy this because I usually want something greasy, meaty and cheesy on my pizza. So I was surprised when I enjoyed the refreshing flavours of the vegetables, in particular the zucchini. Tomato and basil fresh tomatoes, basil, mozzarella. This is usually my pick of topping, it is a great combination of flavours and when done well, it is perfection. Unfortunately I thought the basil was over cooked and lost all its strong flavour. I think this would have been brilliant with buffalo mozzarella. The Bronx special mild pepperoni, cabanossi, beef sausage, shredded beef, mozzarella. Not only did I want to try their signature pizza (that they named after themselves), it also had everything I like on a pizza. As expected, I enjoyed this pizza but nothing really wowed me. BBQ Chicken oven roasted chicken breast, onion, mozzarella with BBQ sauce. I’m not usually a fan of chicken on pizza, but the chicken pieces were shredded small enough that they weren’t dry. For some reason I was really drawn to this pizza between all the different toppings. 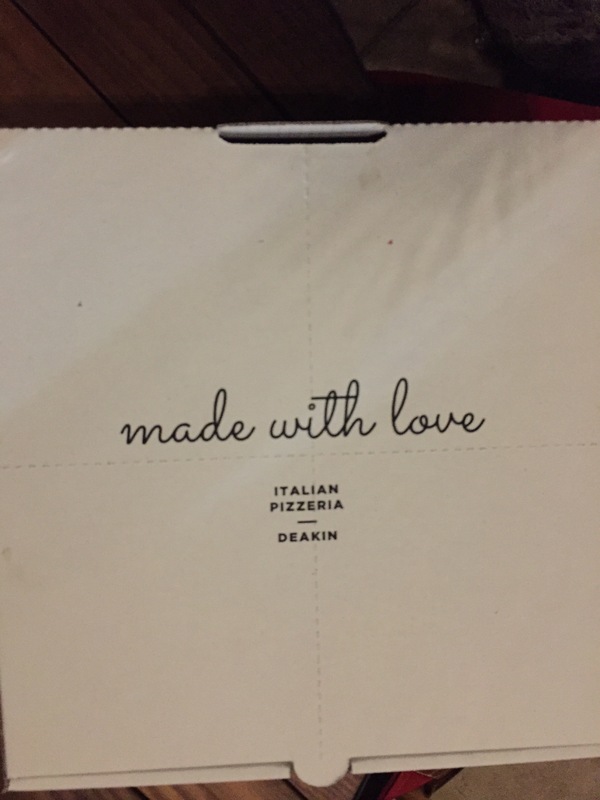 In no way is this authentic Italian pizza, this is Australianised take away thin crust pizza done really well and I think there is a novelty to the enormous size. It’s a shame it is so far away from my house. I was lucky enough to dine as guest at a food blogger ‘Lunch by the lake’ at Molto Italian thanks to a lovely friend Serina (go check out her awesome blog here) and the very generous owners of Molto Italian. They offered us an Italian feast and although our meals were complimentary, all opinions are my own. Nonna’s tiramisu ($15.00). I can never say no to a tiramisu and it is sad to say I’ve had more disappointments than good ones. This was nice but not the best I’ve had, it tasted more like whipped cream rather than a rich mascarpone mixture. The two ‘gripes’ that I’ve heard from others about Molto Italian were about the prices and about the noise. I know that Canberra’s dining scene can seem more expensive on an international scale as well as interstate, but all along the Kingston foreshore it seems to be next level. 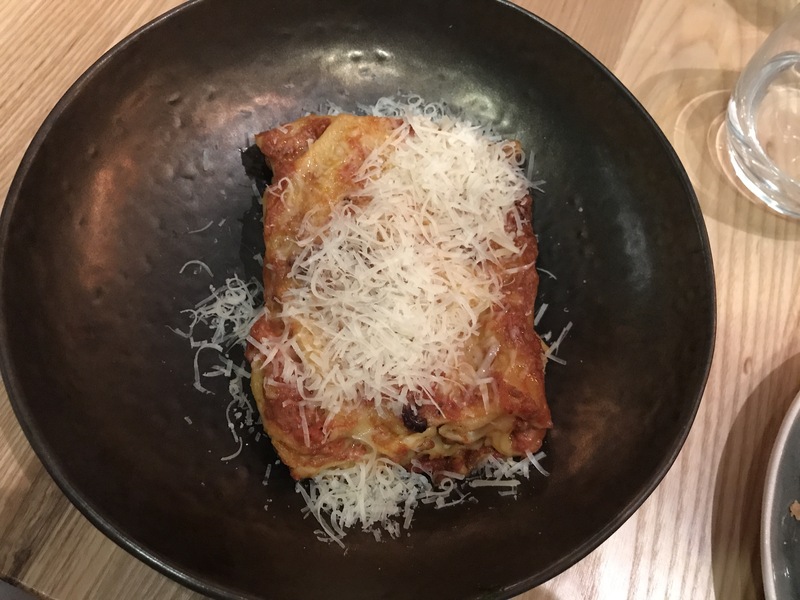 I had written my impression of each dish before including the prices from the menu in my blog, but I felt that the prices were fair considering their import the best produce in their opinion to ensure quality authentic ingredients. We were lucky enough to have an early start before a busy lunch period but I didn’t notice a noise problem. This might be at night when the foreshore gets crazy busy. I would not have enjoyed as many dishes if I was coming with friends unless I invited 5+ people. Through this invitation, we were able to taste a large variety of the menu as well as preview some upcoming dishes from the winter menu and I am able to say that I enjoyed almost all the food that we were lucky enough to experience. I am excited to go back and try their upcoming winter menu. 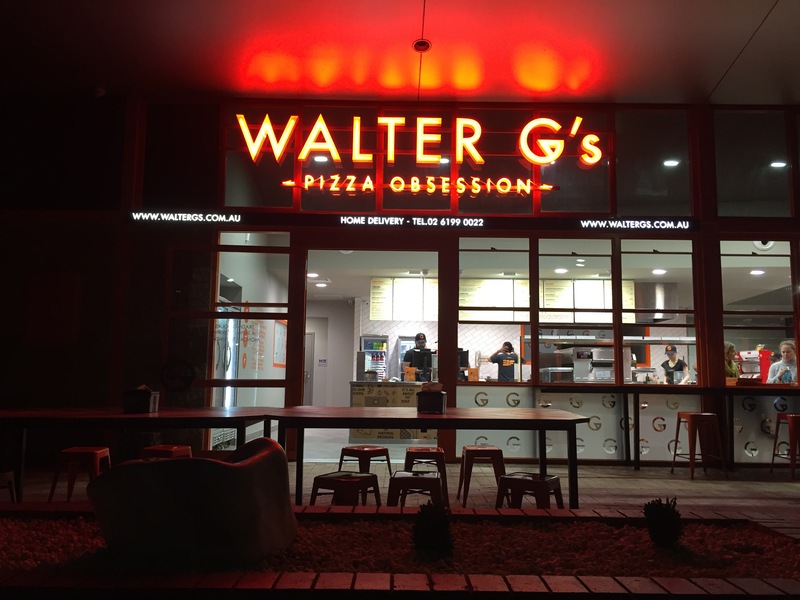 Walter G’s – when did this happen? Every time I drive past the dark back streets of Dickson, a red lit sign always catches my eye and I’ve been wondering what has taken the place of the old Trinity night club. This time as we were headed to Plaka for dinner, I was determined to see the source of the red neon lights. Walter G‘s boasts delicious pizza and desserts with many people coming in and out (I cut them out of the photo); I like how they have a vegan pizza. I wonder how long it has been there. Tell me dear reader, have you been before? What did you think? We were taking a big “Risk” (tee hee, I love that game) when we headed down to Guild on a Friday night without a booking, but we were lucky enough to squeeze on a table for two between the three of us, but the tables are big enough that we weren’t squished at all. Peach, ginger and cinnamon virgin spritz roasted peaches infused with ginger and cinnamon, combined with lemonade and a hint of mint ($9.00). My friend really enjoyed this, she said it was sweet and very refreshing. I loved the names of pizza, they have nerdy witty humour. My friend can’t eat pork so there was very limited choices for her, maybe they could eventually bring in beef mince pizzas? Connect 4 marinated feta, imported gorgonzola, buffalo mozzarella, provolone and cracked pepper on an oil base (11″ size $17.00). I didn’t get to try this pizza but my friends were sadden that there wasn’t even coverage over the entire pizza. Zombicide spicy chorizo, pepperoni, smoked ham, herbed lemon chicken breast, smoked bacon and homemade BBQ sauce (11″ size $18.00). A very delicious, meat-a-licious pizza, with a more even coverage of topping. I think if the base was a little fluffier or thinner, the slightly burnt edges wouldn’t be so hard. The pepperoni pieces are a little thicker than I’m used to but that meant they didn’t burn as much. There was a wait on food because it was so busy and the nature of wood-fired pizza but we didn’t notice as we were having so much fun playing Love Letter (Batman edition). A fun and easy to learn game while waiting for dinner. After dinner, we switched over to playing Dixit by a recommendation from the Game Master (I have no idea what his name was so that’s what I’ll call him), which led us almost to closing time. When we went to pay the bill, I was surprised to see a gamage surcharge of $3.00 per person which we would have happily paid, but we didn’t see any signs nor were we told about it. Lots of games to choose from all around the restaurant. There are still a few teething issues with timing and service but they have only just opened over a week ago. We really enjoyed our time here, there are many games and options and the friendly staff are only more than eager to help; if you have zero idea they will also run through the game with you. It is very refreshing to have a something in civic that is fun and doesn’t revolve around drinking, although there are plenty of options for that too if that’s what you’re into. My friends and I would be very keen to come back and try out more of the menu and play more of their games. Michelle from HerCanberra Food & Drink and I met up after my big Europe trip and before she left for her big America trip; we were overdue for a massive catch up. She asked where I wanted to eat and out of the blue I suggested we try Locale in Deakin. Being a Tuesday night for only two people, I figured we could get away without booking but that wasn’t the case as the place was packed and the remaining tables were reserved. 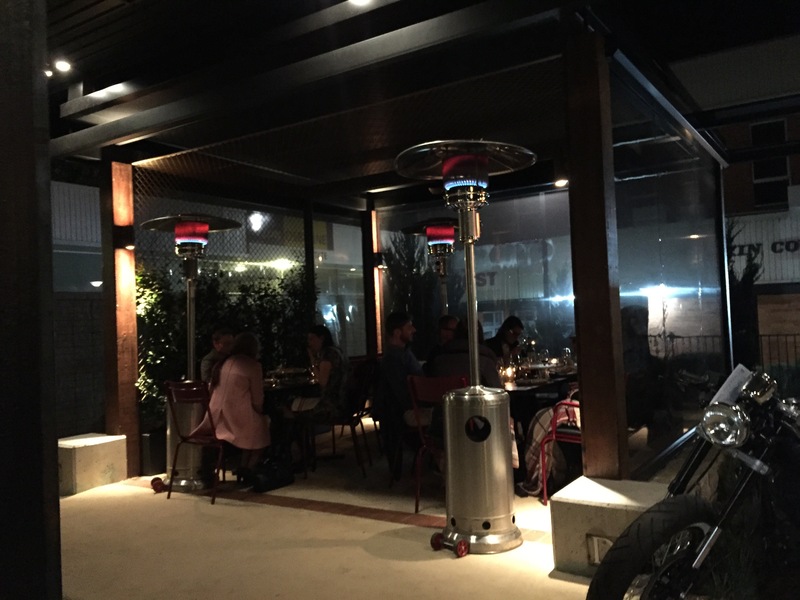 We could have sat inside at the bar for just over an hour or outside without a time limit (or heating), but knowing that I was a slow eater, it was logical that we chose the outdoor seating and they gave us a blanket to keep warm. Tortino al cioccolato Perugia chocolate warm pudding, salted peanut gelato, caramel sauce ($14.00). 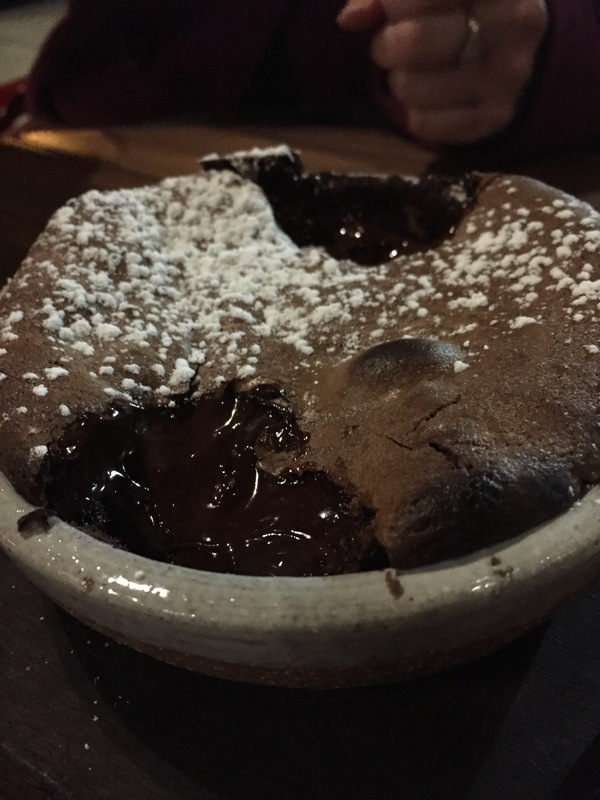 Chocolate lovers rejoice, we have found the dessert for you! I found the pudding intensely rich but when paired with the gelato it was perfectly balanced. I was unsure why there was a caramel sauce as it didn’t really need much more but maybe it is for the intense dessert die hards. We took one small bite at a time but we eventually finished it. As the night went on, it got even busier inside than before. It easy to talk outside, while inside can get a bit noisy and a tight squeeze to get past tables. There was outdoor seating with heating but I assumed those people booked unlike us. While we were eating dinner, countless people were getting take away pizzas. I love how their boxed is perforated for easy tearing into plates and therefore means even less to clean up! Despite sitting outside and away from everyone else, we were never forgotten. The service was really friendly and attentive. I would definitely come back again in a heartbeat and any know many people who would love to eat here with me. I suffer from serious FOMO (fear of missing out), so when illness stopped me from all my pre-planned dinners/lunches/weekends away, I promised myself that I would postpone them all rather than missing out altogether. One of these planned outings was to go to Provini, the newly opened Italian restaurant run by the Cocu group in Civic (where La Scala used to be). I excitedly made my booking and not long after received a sms prompt about my reservation. A few hours after that, I received another sms to confirm my booking with a ‘YES’ reply, apparently I was not the only one over excited about my postponed dinner. Spaghetti carbonara guanciale, pecorino, yolk ($24.00). The pasta looked underwhelming being dry with not many ingredients. My friend didn’t really enjoy it. Tagliatelle al nero di seppia squid ink tagliatelle, prawns, pippies, chilli, tomato ($29.00). My other friend had the same problem as the cabonara, when it arrived it was very aromatic but it felt really dry and underwhelming without a ‘sauce’. It also seemed like a very small serving of pasta for the price. 600g dry age rib eye with roasted tomato and choice of two sides (designed to share $66.00). 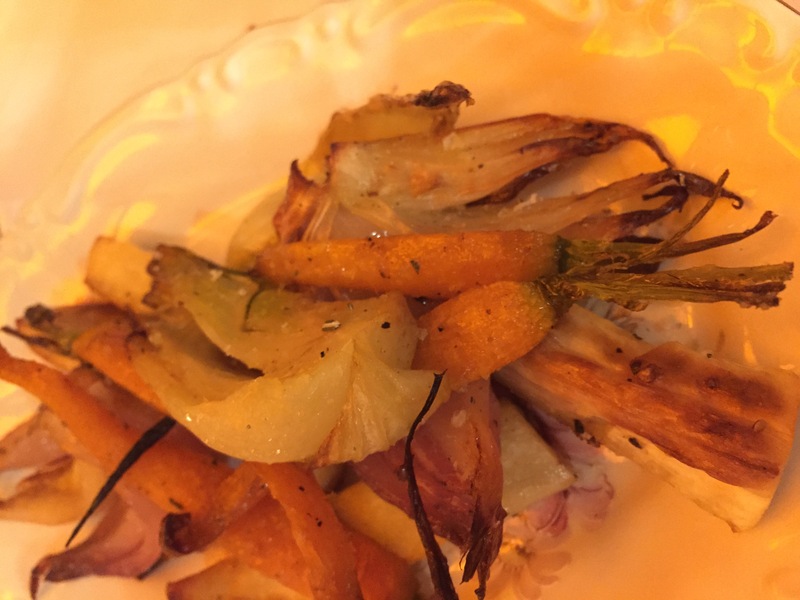 We chose wood roasted vegetables with rosemary salt and baked roman gnocchi for our sides to share. We found the rib eye to be okay, a little underseasoned which was easy to taste because there was no jus or sauce to hide behind. The vegetables with a nice choice for a side but I preferred the gnocchi because it was more cheesy and decadent. I personally and selfishly could finish this on my own but I guess it is nice to share the price tag. Wood roasted vegetables with rosemary salt. 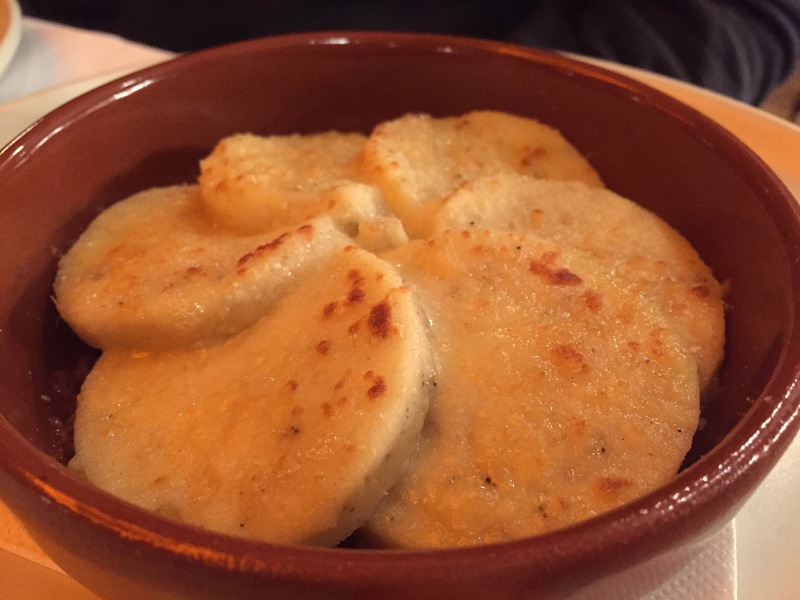 Baked Roman gnocchi. I was super excited about trying Provini because I love Italian food but I found the service to be inconsistent (some were friendly and some seemed arrogant) and the food overall to be disappointing that we didn’t want to stay for dessert; we were actually considering a second dinner somewhere else because we found the serving size a bit small. The pizzas/starters came out pretty fast but there was a long wait before our pastas and mains came out. If I was to come back again, I would maybe try some antipasto and stick with the pizzas. 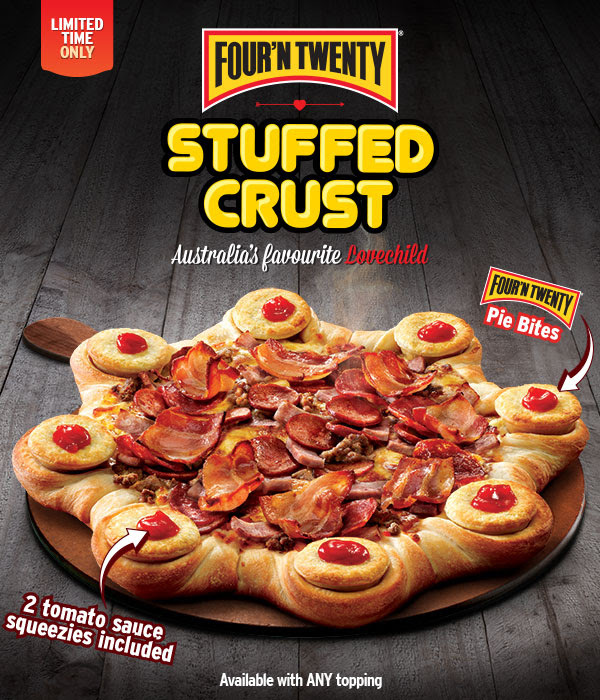 Merging your product with Vegemite is old news, Pizza Hut did it ages ago. They have also incorporated hot dogs and Doritos and now they are at it again. This is two meals in one! Would you try this? Nothing makes you hope that a restaurant is good like when your friend tells everyone that you’ve recommended a restaurant for dinner that night and then to correct her by saying that you have never been yourself but you’ve heard nice things. 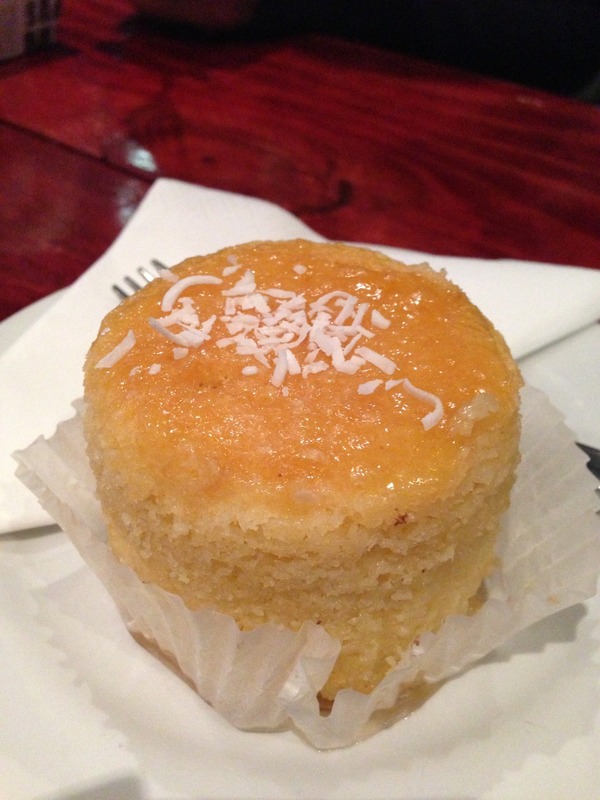 That’s exactly what happened when we went to Neighbourhood food in Gungahlin. I wasn’t quite sure exactly where it was but when we found it, I was surprised to see how casual/cafe style and dim lit it was. I hope the food is better than then decor. Garlic pizza bread ($6.00). A nice pizza base, I just wasn’t a huge fan of the garlic that they used. 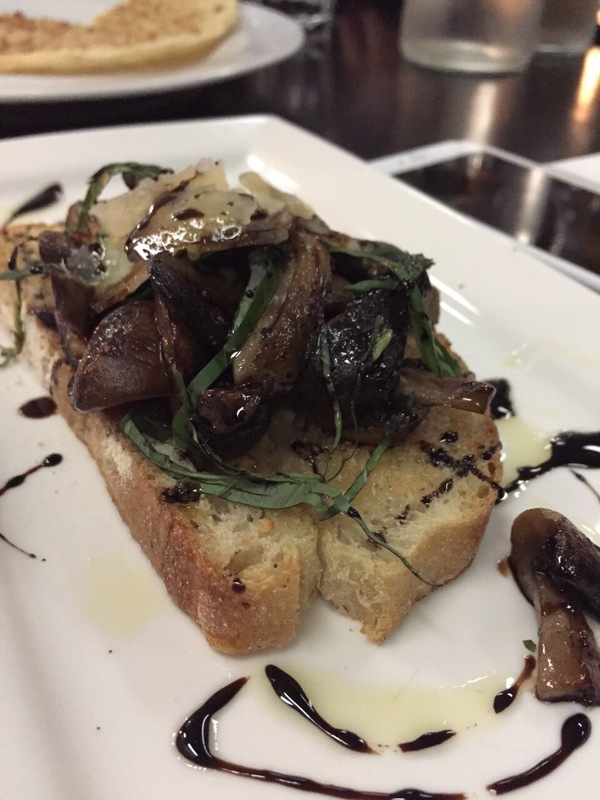 Garlic mushroom bruschetta garlic and butter sauteed mushrooms served on crusty bread topped with herbs ($12.00). I really expected at least two pieces for the price. It was okay, the garlic tasted like it was from a jar but there were plenty of mushrooms and toppings on the singular toasted slice of bread. Tomato bruschetta diced tomato, fresh basil, bocconcini served on crusty bread ($12.00). Steak and mushroom pappardelle in butter and pepper sauce ($22.00). Although in theory this had my name written all over it, I didn’t think it had enough depth to the dish. I really enjoyed the pasta texture, but I found the steak pieces too tough and I ended up eating more of TimmyC’s risotto. Lamb shank risotto slow cooked lamb shank with peas and ricotta ($28.00). This was on the specials board and I stand by what Jerry Seinfeld said when he said: “I don’t want to hear the specials. If they’re so special, put ’em on the menu.”, but I had food envy as soon as I tasted this. The lamb shank was tender, the risotto was perfect and the ricotta was creamy and despite the fact that I don’t eat peas, I just swallowed them whole in my bites. Damn, should have ordered the special. Seafood risotto Barramundi, calamari and prawns ($22.00). My friend said she really enjoyed this dish despite the fact that her risotto was slightly over cooked. Pizza~ we were surprised about the size of the pizza when they set it down, but they were so good we ended up eating all of it anyway. I really liked their pizza base and generosity of toppings. Classic supreme pizza pepperoni, capsicum, olives, pineapple, onion, bacon and mozzarella ($22.00). Rocket salad ($8.00). My friend’s Mum was doing the responsible thing on the table ordering a side salad. My friends and I really enjoyed it here, it is nice to have good food tucked away in the suburbs. I am definitely keen to come back and try some of their prawn pastas. The service was exceptional, they were very friendly, knowledgeable about their menu and very attentive with drinks. After coming home from Sydney once again, we found ourselves in a predicament of not even having the basic staples of milk and bread in the house while suffering a major case of ‘so not bothered right now’. So we instinctively order Pizza Hut on our way home and time it perfectly with our arrival to the front of the shop. As we place our usual order of deep pan cheese pizza and whatever else takes our fancy on the day, we were informed by the Weston store that they no longer do a deep pan base… Errr come again? Since when did this happen? I mean I know they have released some crazy things to stick out from the crowd like Doritos crust and Vegemite stuffed crust, heck I can even get a Hershey’s cookie the size of my face at the moment, but don’t mess with the basics like bases! The deep pan pizza base provided the best cheese topping to pizza base ratio and before you start wondering why I order just a plain cheese pizza, it has come after watching a very loved movie of mine Home Alone. We settled for a Perfecto base, but it wasn’t the same. I wonder if it is all stores across ACT that aren’t doing the deep pan pizza anymore or if it is just the Weston store? Not that I can eat anything like this any time soon, I just thought it was interesting what new things Pizza Hut is adding the humble pizza crust. It is so delicious already, why add anything? When I rang Pizza Gusto, I asked very sceptically if they took reservations, from what I’ve heard they were just a little establishment boasting delicious pizzas but their business mainly comes from takeaways. They very nicely said yes and asked if I would like to sit inside or outside, without a sarcastic reply after glancing at the frost covered grass, I requested a table for four inside. You have more of a chance of finding a park in Braddon at night so that wasn’t a problem. When we walked in, we saw just how small the restaurant was. Only fitting 5 square cafe tables in max and with a very basic set up which included plastic cups for water that you fill from the outside animal shaped tap, eating out of the pizza box and a flyer for a menu, I knew it had to have amazing pizza to have thrived in Braddon for so long. Pizza (33cm – 8 slices). We were trying to choose classic pizzas with simple ingredients to use it as a measuring stick against every other pizza we’ve had. They came out rather promptly and not oily at all, perfect crust and base, fresh ingredients which amplified the simple flavours. Pizza gusto definitely makes it in my top 3 pizza places of Canberra. Margherita – tomato, mozzarella, bocconcini cheese and fresh basil ($16.00). Supremo – tomato, mozzarella, Calabrese salami, shaved leg ham, veggies mushrooms, pineapple and olives ($20.00). I looked a little disappointed when everyone said that two pizzas should be plenty between the four of us, but since the first two were so awesome we were able to order one more pizza that was a little outside of the ‘box’. Patate – garlic oil base, finely sliced potatoes, mozzarella, rosemary, and sea salt ($17.00). On the little salty side but the potatoes were perfectly done. Despite the salt, I found the pizza overall to be very bland and it was my least favourite pizza of the night. Not a fine dining restaurant by any means but if you want a good pizza to dine in (best to reserve a table) or to take away, Pizza Gusto is the place to go. During a lazy cold Friday, my friends and I were trying to decide where to go for a low key, simple non Asian dinner (we had many dumplings and bowls of rice for lunch). For some reason I was drawing a blank until late in the afternoon a light bulb went off in my head – Wilbur’s in Hackett. 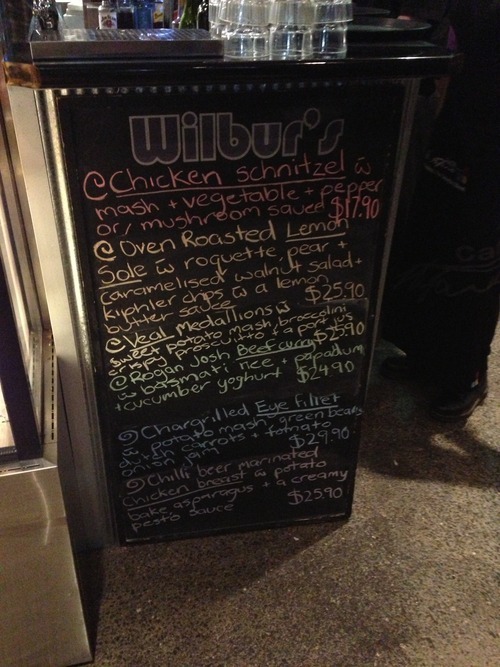 I had heard wonderful things about Wilbur’s atmosphere, service and most of all their PIZZA! We were greeted with a friendly face and although we didn’t reserve a table they were able to sit us down and set us up with menus and water very promptly. They had a whole board full of reasonably priced delicious options but I was here for pizzas and I didn’t need to add more choices to an already very vast list of pizza toppings. 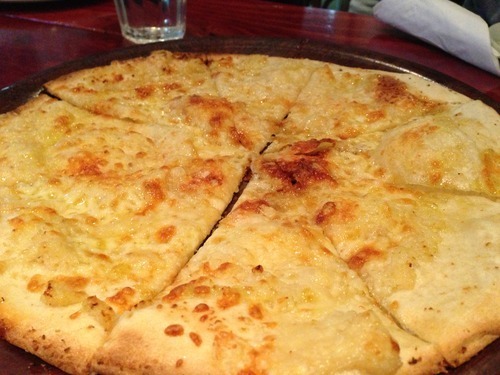 Garlic pizza – shaved parmesan cheese, drizzled with olive oil ($9.90). A perfect entree with garlic and cheesey goodness. When we asked the waitress what her favourite pizza was, she said the Artisan without any hesitation, so obviously that had to be one of the choices. We couldn’t pick a favourite, both had a delicious base, not overly oily and had a nice mix of flavours and they weren’t heavy handed with the ingredients. I can see why people come here for the food. 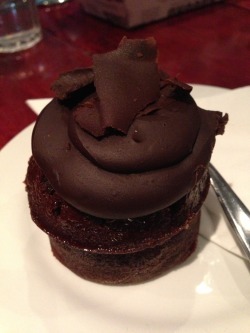 Some of us weren’t content leaving without dessert so we did the girly thing and shared several cakes between us. Chocolate mud and Lime coconut cake. Your typical ‘cafe cakes’, nothing too special. I felt the chocolate mud could have been served warm for a better outcome but the lime and coconut cake was very moist with a clear refreshing lime zest. Wilbur’s has a great staff service with a diverse atmosphere, sporting a fire place for a more intimate setting at the back and giant TVs for sport enthusists at the front. No matter where you are in the cafe bar, everyone seemed to be having a good time and enjoying their meal.